There is often confusion over language in describing technique. One example is the action of pulling in the nail joint, called “curling” in the Taubman Approach,but described by others as curving. In Taubman language, “curving” relates to the natural contour of the fingers in the mid-range of motion when the hand and arm are at rest by the side, without pulling in the nail joint towards the palm. In the diagram below I have attached an example of what NOT to do, which also illustrates this example of confusion in vocabulary. The fingers are curled (which creates tension), yet described as curved (the natural hand position). When we play passages in close position, the fingers need to be curved, not flat. When the hand is more open, the fingers will be flatter to allow the hand to open comfortably. 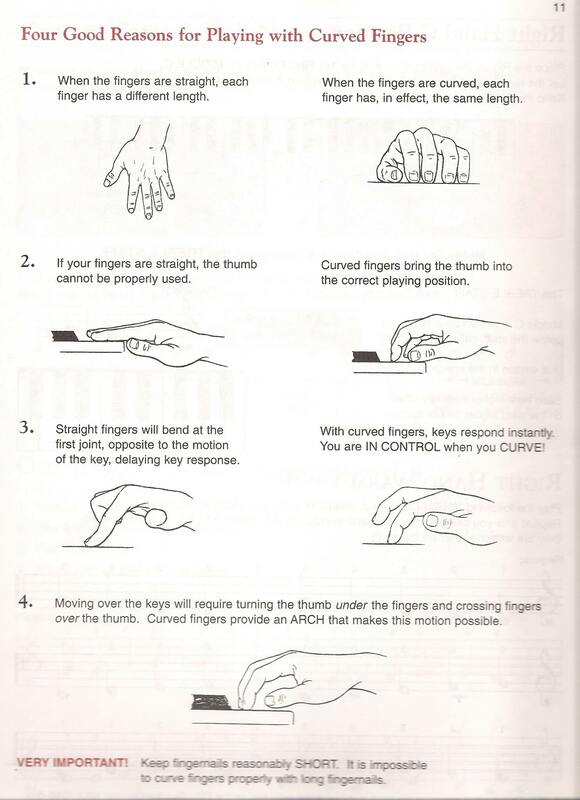 Many teachers correctly warn against students attempting to play with very flat fingers in close position, but overcompensate by having the student curl their fingers. They worry that the student does not want to curl their fingers, yet the student’s reluctant reaction is sound! The fingertips should not be all in a row, as per the image on the right, as our fingers are of completely different lengths. Rather, in the Taubman Approach, we use “in” movements towards the fallboard and “out” movements towards the body to accommodate our shorter and longer fingers, and to allow them to remain in their natural position. I would have the student observe the natural hand position when the hand is at their side, then have the student practice coming to the lid without that natural hand position altering. Watch for no stretching, curling, changing in any way from the side to the lid. Then you can practice coming to the keyboard. From there, I would need to see and work with the student if any issues remain so far. ← FAQ: Will taking tumeric cure my RSI? Thank you for sharing your ideas about teaching the Taubman principles!